Senegal has moved troops towards the Gambian border in an effort to force President Yahya Jammeh to accept electoral defeat and step down. Senegal is leading the operation, which is supported by Nigeria and other states in the region. Mr Jammeh has been told to leave office by the end of Wednesday and hand over to last month's election winner, Adama Barrow, who is currently in Senegal. 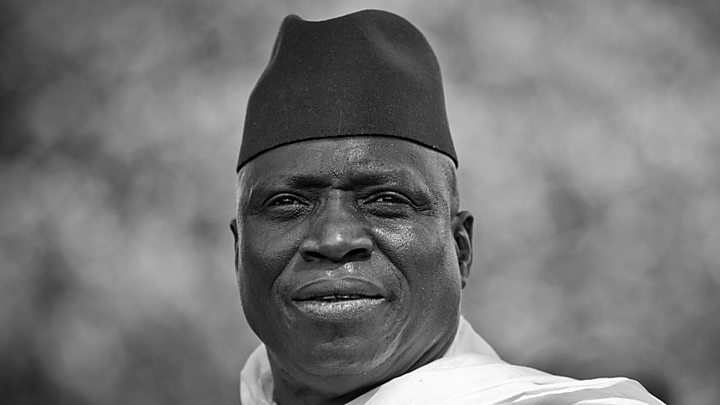 Mr Jammeh has ruled The Gambia since taking power in a coup in 1994. Wednesday was meant to be his last day in office but parliament granted him three more months in the post. Garba Shehu, official spokesman for Nigerian President Muhammadu Buhari, said Mr Barrow was preparing to be sworn in as president "on Gambian soil" on Thursday. At least 26,000 Gambians, fearful that violence could erupt, sought refuge in Senegal this week. Meanwhile, thousands of UK and Dutch tourists are being evacuated from the tiny West African state, which is popular with European holidaymakers because of its beaches. Why is Senegal taking the lead? Ecowas, the Economic Community of West African States, mandated Senegal because it almost surrounds The Gambia. Col Abdou Ndiaye, a spokesman for the Senegalese military, said Ecowas had decided on the deadline to try to achieve a diplomatic solution. "Things are getting into place and Ecowas forces are ready to intervene if needed after midnight if we can't find a diplomatic solution to the Gambian crisis," he said. The Ecowas force is seeking UN Security Council endorsement to use "all necessary measures" to help remove Mr Jammeh. The Gambia's entire armed forces are made up of only about 2,500 troops, making it difficult to see how they can defeat a regional force if it moves in, says BBC Africa Monitoring security correspondent Tomi Oladipo. 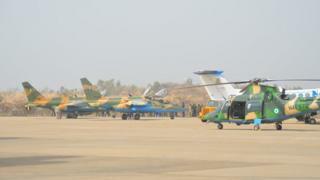 Nigeria says it sent fighters and other aircraft, along with 200 personnel, to Senegal on Wednesday morning. Nigerian navy vessels are also on standby and a warship that sailed from Lagos on Tuesday will have the task of evacuating Nigerian citizens while putting on a show of force. Ground troops are also being provided by Ghana. Could there be a refugee crisis? Most of the civilians crossing into Senegal are women and children, the UN refugee agency said, citing Senegalese government figures. In the Gambian capital, Banjul, a restaurant worker who gave only his first name, Musa, told Reuters news agency: "People are afraid, we don't know what's going to happen. "We hope he [Mr Jammeh] will leave so this will be over quickly and things can get back to normal." Travel firm Thomas Cook said it would fly back to the UK, over the next 48 hours, 985 customers from package holidays after the UK Foreign Office advised "against all but essential travel to The Gambia due to ongoing political uncertainty and potential military intervention following the presidential elections". About 1,600 Dutch citizens are also being flown home after similar advice from their government. Tourism has become the fastest-growing sector of The Gambia's economy, and the country, which has a population of about two million, was marketed to holidaymakers as "the smiling coast of West Africa". But many of its citizens are poor and complain of political repression. Some, including the goalkeeper of the national women's football team, have drowned in the Mediterranean trying to reach Europe in the hope of a better life. Why is Mr Jammeh refusing to leave office? Mr Jammeh has declared a 90-day state of emergency, telling security forces to "maintain absolute peace, law and order". He says there were irregularities in the election process, including the turning away of some of his supporters from polling stations, and errors made by the electoral commission. The commission accepted that some of the results it initially published contained errors but said Mr Barrow had still won. Mr Jammeh has said he will stay in office until new elections are held. Retaining power would also ensure he was not prosecuted in The Gambia for alleged abuses committed during his rule. The US state department urged Mr Jammeh to peacefully transfer power to Mr Barrow on Thursday. "Doing so would allow him to leave office with his head held high and to protect The Gambian people from potential chaos," spokesman John Kirby said.